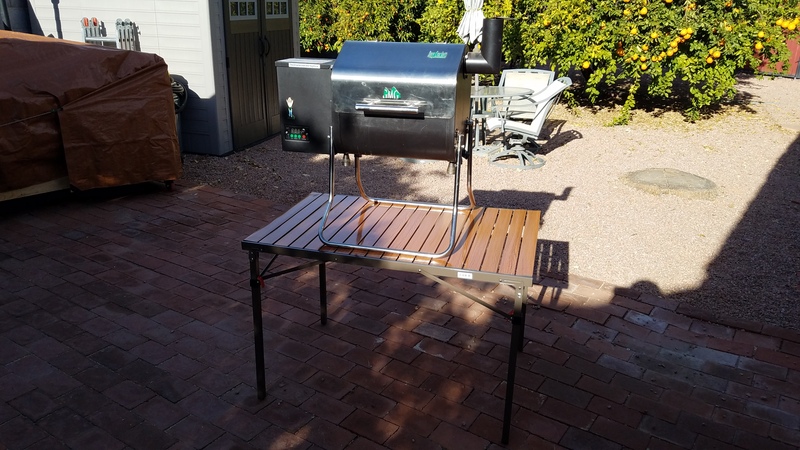 finally found a table for my grill-smoker – RV Cheaper! January 1, 2018 RV Cheaper! I finally found a stable metal table for my Smoker/Grill combo. It’s 42″ wide, 28″ deep and 28″ tall. It seems about 3 inches taller than I would like, but still at a very comfortable height. I’ve been searching for a table top about 42″ x 30″ that I could stow in the basement of the RV, it’s been tough to find one this sturdy so thought I’d share. Now my outdoor kitchen is complete, I’ll share photos next time I have it all setup. I’m not compensated if you buy via the link in the Camping World photo below. Here’s how my smoke fits, normal, shorter grills would be at a more comfortable height. When folded, the braces are at the end of the legs so I could not shorten the legs. Click on the photo if you want to check if the sale price is still available. I’m not affiliated to Camping World so I’m not getting compensated if you buy this or anything else from them.